Due to the popularity of the “Hip Hop Bangerz” playlist on our Soundcloud account, we have just uploaded a more extended version to Spotify. These are joints by dope artists we’ve worked with and promoted over the years, the real deal in rhymes, lyricism, beats and turntablism. 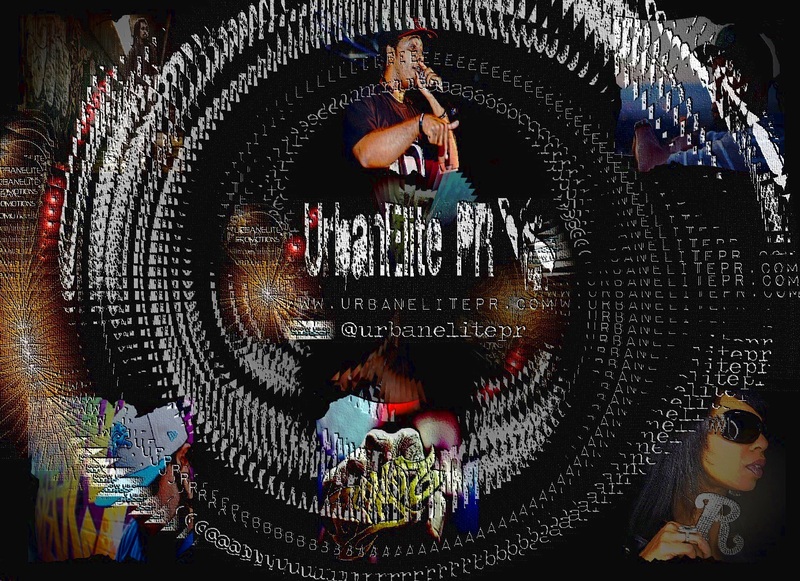 A mix of official singles and buzz tracks by and featuring Souls of Mischief, Rah Digga, Skyzoo, Horseshoe Gang, Copywrite, Melanin 9, Vast Aire, Wu Tang’s Cappadonna, Talib Kweli, Genesis Elijah, Royce da 5’9″, Verbal Kent, Deeprooted (Johaz & Mr Brady), Matt Maddox, Tragedy Khadafi, Bumpy Knuckles, Constant Deviants and more. As a student of African history, African-American figures such as Malcolm X & Huey Newton and politics, not surprisingly in this interview he outlines his views on corruption, social cohesion, oppression, justice, war, peace, the political systems at home and overseas and much more. 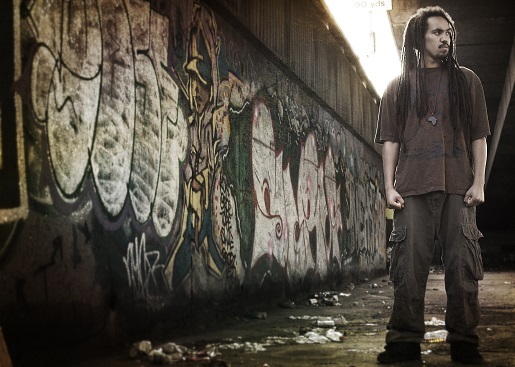 It was his introduction to legendary hip hop artists such as Immortal Technique, Nas, Dead Prez, Tupac & Wu Tang which motivated the young man to study more, and it has come full circle as he now portrays his views as an Emcee. 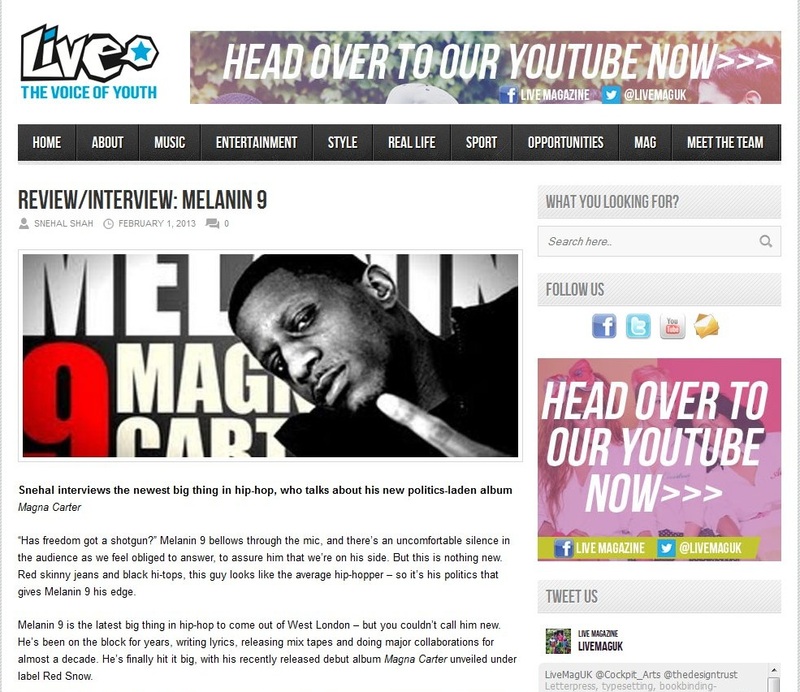 Melanin 9’s launch night for his new album “Magna Carta” took place at The Vibe Bar in London’s Brick Lane in late November, and the venue was rammed full with the city’s hip hop fraternity there to see him joined by Choice FM’s DJ 279, Genesis Elijah, Rewd Adams, Iron Braydz, and his Triple Darkness sparring partners Cyrus Malachi and Phoenix da Icefire. 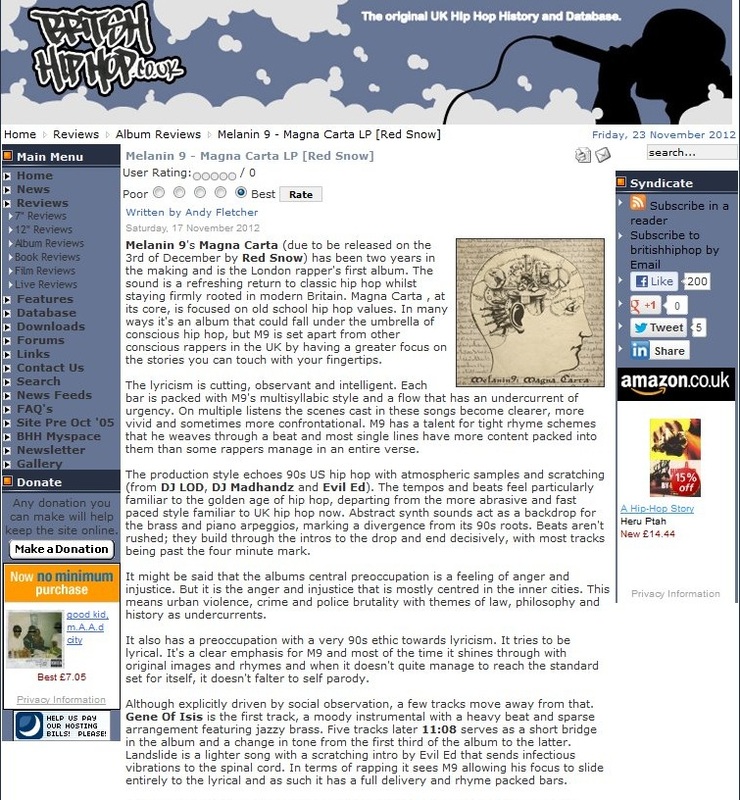 As the name suggests, BritishHipHop.Com have been one of the long standing supporters of UK hip hop, but have also covered a wide variety of international artists. Andy Fletcher from the magazine sat down with London’s Melanin 9 recently ahead of the release of his new album “Magna Carta”, due out on 3rd December. 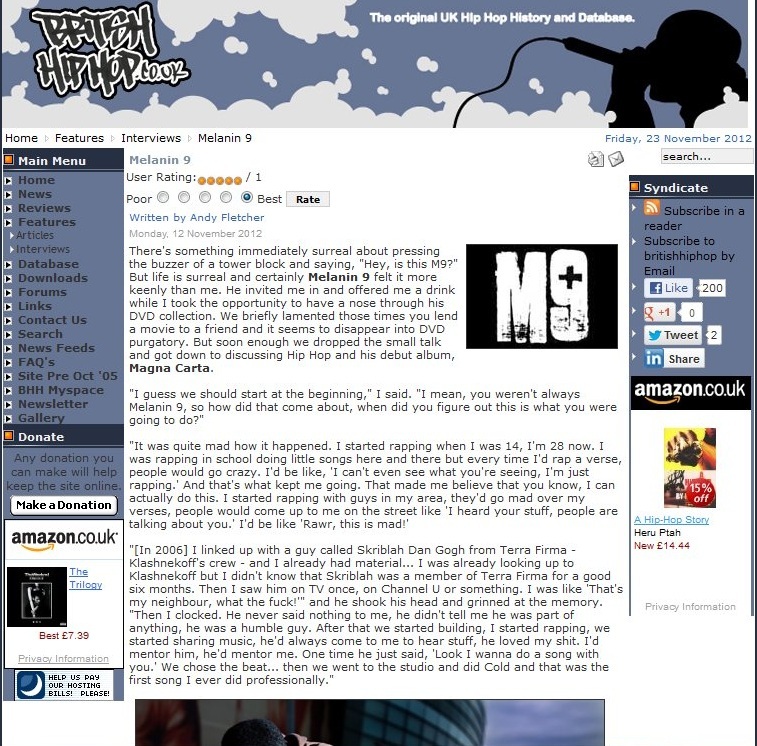 It’s been a busy couple of weeks for the talented emcee, freestyle performances for SBTV being featured on The Source in the United States, the launch of his single & video this week for “White Russian” featuring Roc Marciano, premiered by Nah Right and covered by many top international onlines including Hip Hop DX and 2 Dope Boys, and the preparation for his launch event tonight, Friday 23rd November upstairs at The Vibe Bar, 91 Brick Lane, London E1 (8pm – 1am, entry £5) where he’ll be joined by DJ 279, Genesis Elijah, Iron Braydz, Rewd Adams, Cyrus Malachi, Phoenix da Icefire, Skriblah Dangogh and Logic. 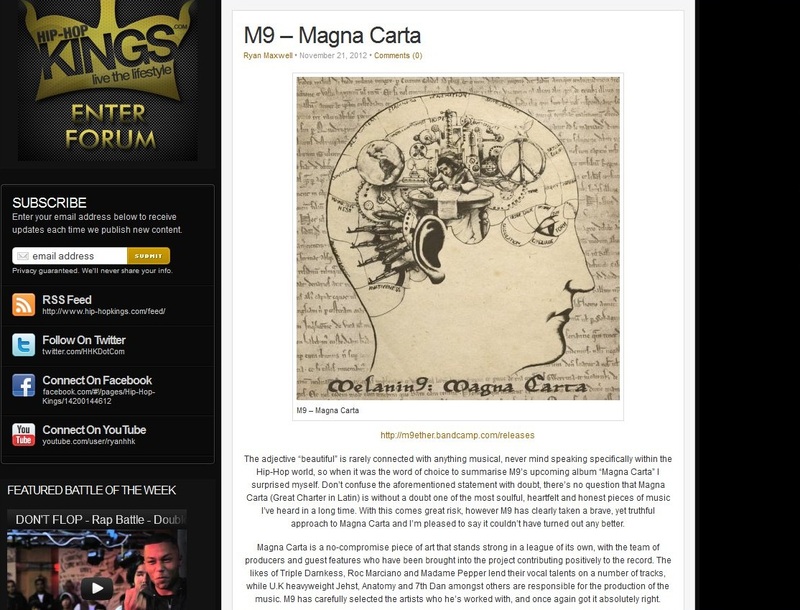 With just over a week and a half to go until the general public release of Melanin 9’s debut album Magna Carta on 3rd December, one of the UK’s leading online specialists for hip hop & rap music, Hip Hop Kings, is the latest to give the release their endorsement. You can also hear him live on Guess Radio in London from 7.30pm GMT / 2.30pm EST with DJ Sammy Jay on the Xposure show at http://www.guessradio.co.uk Thursday 22nd November.